The Gambia has re-joined the Commonwealth almost five years after ex-President Yahya Jammeh took the country out of the organisation, which he described as 'neo-colonial'. He said he was not happy with the Commonwealth for accusing his government of human rights abuses and electoral malpractices. 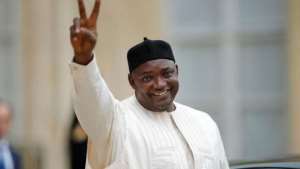 After Mr Jammeh was surprisingly defeated in the presidential election in December 2016, one of the first announcements of his successor, Adama Barrow, was to say that The Gambia would be back in the Commonwealth fold. Last December, the Gambian Parliament unanimously affirmed the country's desire to re-join the organisation. The country's formal application to become a member again was presented to Commonwealth Secretary-General Patricia Scotland by the Gambian High Commissioner to the United Kingdom, Francis Blain, last month and this was unanimously backed by member states. On Thursday, a flag-raising ceremony at Marlborough House, the London headquarters of the Commonwealth Secretariat, marked The Gambia's return, bringing the grouping of mainly former British colonies back to 53. The Gambia will now attend the Commonwealth Heads of Government Meeting (CHOGM) in London in April. Mr Blain said: 'I am thrilled to represent my country as it formally re-joins the Commonwealth after an absence of several years - and to become High Commissioner rather than Ambassador. 'The Gambia looks forward to being able both to contribute to and benefit from the collective wisdom of the Commonwealth family of countries and to playing an active role in supporting the work of the Commonwealth Secretariat and the many other organisations and initiatives that flourish as expressions of Commonwealth connection. 'The Government and people of The Gambia will also draw on all that the Commonwealth collectively has to offer, assisting in practical ways to address a wide range of pressing issues - including protecting the environment and tackling climate change, and the empowerment of women and young people,' Mr Blain added. Secretary-General Scotland said: 'When The Gambia left in 2013, the heads of government expressed their regret in its leaving the Commonwealth family. The Gambia became a member of the Commonwealth on achieving independence from Britain on February 18, 1965 but withdrew on October 3, 2013. Apartheid South Africa withdrew in 1961 because newly-independent African countries that had joined the Commonwealth strongly opposed its membership because of the government's system of racial discrimination. After the democratic elections of 1994 that saw Nelson Mandela become the country's first black leader, South Africa was readmitted to the organisation. No country has been formally expelled, but in November 1995 Commonwealth leaders took the then unprecedented step of suspending Nigeria under General Sani Abacha. This suspension was lifted on May 29, 1999 with the election of a democratically elected civilian President, Olusegun Obasanjo. Zimbabwe, on the other hand, was suspended from Commonwealth councils in March 2002. This followed the presidential election, which the organisation deemed to have been marred by a high level of politically motivated violence and during which the Commonwealth said the conditions did not adequately allow for a free expression of will by voters. Then in December 2003, following a Commonwealth Heads of Government Meeting (CHOGM) statement on Zimbabwe, former President Robert Mugabe withdrew his country from the Commonwealth.